Map of the Middle East unrest-Map credit: University of Notre Dame OCW. Last Tuesday, March 1st Israeli dailies lead with the latest developments from Libya: Yedioth Ahronoth, Haaretz and Israel Hayom. Yedioth Ahronoth tells it readers that the international community is increasing pressure on Mu’amar Qadhafi. Haaretz and Israel Hayom both lead with the planned deployment of American ‘military assets’ off the coast of Libya. Maariv leads with comments from Prime Minister Binyamin Netanyahu regarding Israel’s own international pressure on the subject of the settlements. Speaking at a meeting of Likud lawmakers on Monday night, the prime minister said that Israel could not ignore growing international pressure over construction in the West Bank, but that the government would preserve ongoing settlement activity to the best of its ability. "We are currently making efforts to maintain existing construction, but we must understand that we are [faced with] a very difficult international reality," he told the meeting. According to Haaretz, Netanyahu met earlier in the day with Defense Minister Ehud Barak and Attorney General Yehuda Weinstein, to discuss the state’s response to 15 High Court petitions demanding the demolition of all illegal settlement outposts built on privately-owned Palestinian land. The report says that Netanyahu has decided that the state’s response will be to announce that it will, as required, raze all of the outposts, with the sole exception of the house owned by slain IDF officer Eliraz Peretz. At the same time, however, the government will begin legalizing illegal outposts built on state land. This flurry of activity surrounding the settlements comes a day after violent clashes between security personnel attempting to demolish three illegally erected structures at the Havat Gilad outpost in the West Bank and settlers. Hours after the incident, right-wing protesters blocked a main road in Jerusalem to protest what they claim was the use by security forces of rubber bullets during the operation. According to Army Radio, settler leader Rabbi Chaim Druckman sent a sharply-worded letter of protest to Netanyahu on Tuesday morning over the incident. Joining others in condemning alleged police fire at anti-demolition demonstrators, the rabbi protested the disgraceful contempt with which male officers dragged women during the demolition. Meanwhile, police chief David Cohen conducted an assessment of the situation with his top commanders Tuesday morning. Following the meeting, Cohen said that now is the time ‘to show responsibility and restraint, and prevent escalation.’ He said the police were ready for all apparent scenarios. The Jerusalem Post leads with the Iranian nuclear program. In its lead story, it quotes senior government sources in Jerusalem as saying that a new IAEA report that Iran may be seeking to develop a nuclear-armed missile only underscores the importance of upgrading pressure on Iran and convincing Tehran that a military option is a real possibility if it doesn’t stop pursuing nuclear arms. The officials were responding to a confidential document leaked over the weekend that signaled the UN body’s growing frustration at Iran’s lack of cooperation. The mainstream Israeli press had turned its attention to the second annual conference of J Street, the left-wing pro-Israel organization in the United States. After the controversy over which Israeli politicians would or would not be attending the conference, the main headline to come out of Washington was from an American speaker. Dennis Ross, the Obama administration’s Middle East adviser, told the conference that the uprisings in Egypt and throughout the Arab world had a lesson for Israel in its relations with the Palestinians. "If Israel can view one lesson from the events in Egypt, it is the danger of getting stuck with an unsustainable status quo," Ross said. "Just as the frustrations in Egypt grew over time, we should all recognize that the conflict with the Palestinians will only become more intractable over time." Writing in Yedioth Ahronoth, Elyakim Haetzni says that the events of the past few weeks across the Arab world should convince anyone who still had doubts that the Israeli-Palestinian conflict is not the source of all the region’s woes and that things would not be perfect for the Arab masses if Israel simply disappeared. "Millions of people in Tunis, Cairo, Sana'a, Tripoli and Manama have been making their voices heard. Is it possible that they are all lying? Anyone who is fed information by the media – local and global – would expect the cry coming from Tahrir Square to be against the "occupation" and that the "day of rage" in Tunisia would be directed against the settlements. When did we ever hear columnists and commentators, all of whom make a very nice living from the Israeli-Palestinian conflict, say that the Middle East is in a state of foment because of dictatorships, corruption, unemployment and the negation of human rights? When did they ever tell us that the Arab masses would take to the streets to demand a better life for themselves and their children, rather than in the name of the Palestinian people? At least in retrospect, we could have expected that the events of the past few weeks would put an end to the fallacy that Israel and the so-called occupation are threatening to destabilize the entire Middle East and world peace. But, no. Take, for example, General James Jones, the former Marines commander who was until recently head of the National Security Council. He drew up a strategic security plan for implementing the final-status solution and he recommended deploying NATO troops to replace the IDF in Judea and Samaria. At the Herzliya Conference last month, he declared that, ‘time is not on our side, and a failure to act [on the establishment of a Palestinian state] may trigger other Egypt-like demonstrations in other countries in the region.’ As if the realization of the Palestinians’ nationalist ambition would have stopped the people of Libya from rising up against Qadhafi or the people of Bahrain taking to the streets. "The one leader who does appear to have wised up is British Prime Minister David Cameron. He told students in Qatar that some leaders in the Middle East are taking advantage of the Israeli-Palestinian conflict to distract attention away from their own dictatorial regimes. "In too many countries in the Middle East, he said, some rulers say to their people "be angry about that, don’t be angry about the fact that you live in a non-open society". "Even if it turns out that the recent revolutions in the Middle East are nothing more than a transition to new dictatorships, military or Islamic, we now know that what brought so many people out into the streets across the region was their search for more freedom and a better lifestyle. The libelous claim that a Jewish presence in the Land of Israel is the source of all the evils in our region is not the only lie that has been refuted before our very eyes. Anyone with an open mind would find food for thought in the objection of Arabs in East Jerusalem to be annexed to the Palestinian state. Another issue that raises eyebrows is the steadfast refusal of even the most extremist Israeli Arabs to leave Israeli sovereignty and become citizens of the Palestinian state, if, God forbid, one is ever established". Another piece of news – fresh from the past couple of days – should be highly disturbing for all those who advocate the two-state solution: According to London-based al-Quds al-Arabi, the president of the PA, Abu Mazin, and all his family, along with former prime minister Ahmad Qure'i, spokesman Nabil abu Rudayna and Fateh leader Mohammad Dahlan have all asked for and received Jordanian citizenship. The Jordanian authority raised an eyebrow at the request, but did not want to embarrass the Palestinian leaders. Photo courtesy of the University of Notre Dame OpenCourseWare in 2006. 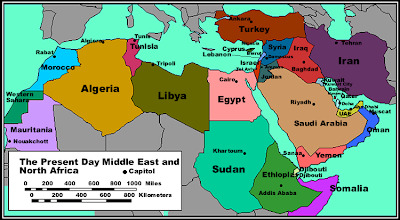 (Refer to http://ocw.nd.edu/arabic-and-middle-east-studies/islamic-societies-of-the-middle-east-and-north-africa-religion-history-and-culture/lectures/Lecture%201.html ).